Every year when all the chefs around town are humming about the appearance of wild garlic, my mind will often wonder to foxes. Even so, I do love it and its just one more affirmation that springtime is upon us. One of my favorite applications for the allium is pesto. Pesto, commonly made with basil, comes from the Italian word pestare meaning to crush. The basic construct is the same. Greens, nuts, oil and cheese. In this case I went with wild garlic, toasted pine nuts, olive oil and Parmesan. The flavor of the pesto will be quite strong, to mitigate this you can blanch the wild garlic before hand or allow it to mellow out in the fridge over the coming days. Basil too, appreciates a dip in some hot water, as it tends to darken when blended, this way it will keep its vibrant green color. Rocket/Arugula is a nice spicy alternative; also subbing in walnuts for pine nuts works a treat. You will need 2 handfuls of greens, 1 handful of pine nuts, a healthy chunk of Parmesan, Olive Oil, and salt, perhaps a lemon. Blanch (briefly introduce them to boiling water) the greens or in this case, wild garlic, and wring out the water. Give it a taste; add salt, more oil, more cheese, lemon zest? Wild garlic isn’t only for pesto; you can use it in sauces or as an herb. 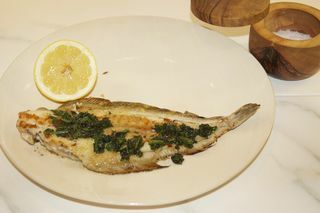 I substituted it for the parsley in Sole Meunière and it was delicious. Gentle enough not to overpower the fish. And pesto isn’t just for pasta. Use it as a spread on toast; I happen to have given the 4-hour baguette recipe from Food 52 a try so was very happy to have a vehicle for my pesto or as a chimmichuri sauce for steaks, adding lemon here makes it especially nice. Needless to say, you will have thought you made way too much and will soon find it all gone. If you’d like to purchase a limited edition 2014 jar you can contact me here or use the form below.